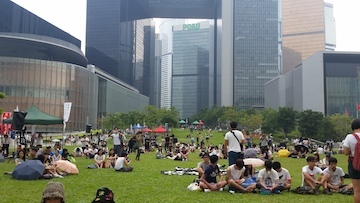 The student strike from Sept 22-26 included a program of public lectures, meetings, and film screenings in Hong Kong’s Tamar Park, located right beneath the government buildings. I was able to go on Wednesday during the day. I’ve been trying to read and translate one Chinese news article a day to improve those language skills, so I managed to do a bit of that while at the lectures. I also happened upon a group of girls knitting on the grass, which made me super excited – I’ve been meaning to buy some knitting supplies but haven’t had the chance, so I asked if I could join in. That’s me in the blue shorts. And there was also a public library that a few students had put together! There was another stand of free books near the main entrance of the park, so I picked up a ton of reading material there. That included a photobook of one of Hong Kong’s most radical politicials, 長毛 (Long Hair), that really treated him as a hero. It included photos of his trip retracing Che Guevara’s travels in South America, which I thought was funny, considering that many people in the United States who use Che’s image are pro-socialism, even pro-communism, whereas here Long Hair is a hero for fighting the Communist Party. The students had also issued a demand to Hong Kong’s Chief Executive, CY Leung, to meet with them within 48 hours. On Thursday morning, that deadline passed, and that night at 8pm, the students and their supporters gathered to march to the Government House on Garden Road (located, strangely, right next door to the American Consulate). As the hour arrived, lecturers and speechmakers emphasized the need to fight – but peacefully. I spent that afternoon at the American Consulate, where they were hosting a meeting for alumni of international exchange programs. All the Fulbrighters (except Henry) were there, along with a number of Hong Kong Fulbright recipients to the United States and various other international visitors program alumni – including Martin Lee (李柱銘), veteran pro-democracy leader and member of the Hong Kong Basic Law Drafting Committee from 1985-1989, when he was expelled from the Committee after the Tiananmen (天安門) massacre. It was incredible to meet him – this legendary figure whom my mom even remembered from her girlhood in Hong Kong. He had a soft but firm voice as he chatted with me and three or four other people about the events in Hong Kong. At one point he mentioned that he loved China, that in the drafting of the Basic Law he had hoped that Hong Kong’s democracy could perhaps influence and change China. And I asked him, Do you think Hong Kong still has the ability to influence China now? He answered by referring to an article he published the day before (he actually said, I am writing an article, to be published Wednesday – until we said, Isn’t it Thursday? and he backtracked that yes, it was already published). In the article, he talked about how Deng Xiaoping had spoken to them on the phone, explaining that the reason Hong Kong’s political status would be ensured for 50 years was to give the rest of China 50 years to catch up with Hong Kong. 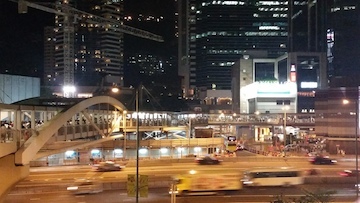 50 years had passed, and China was still behind Hong Kong – but now, Lee said, moving his hands at different levels to demonstrate, China wanted to drag Hong Kong back with them. I headed down to Tamar Park after the Consulate get-together ended (and managed to pick up a box of Pierre Hermé macarons!). Around 9pm, after over an hour of speeches, the students and their supporters finally departed for the slow march up the hill through Central. A few of them carried a massive blow-up head of Leung Chun-ying with vampire fangs. Others carried banners with the names of their schools or organizations. 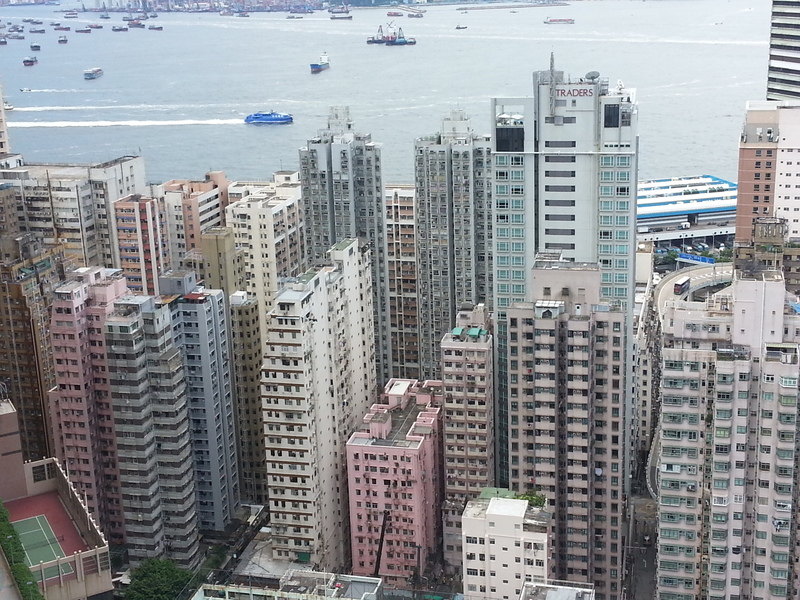 Henry and I walked with them in the back for a little while until they reached Des Voeux Road, and then we left. The students continued on up the hill and stayed outside the Government House overnight, and a car carrying Leung Chun-ying drove away at about 7 in the morning without acknowledging the students. 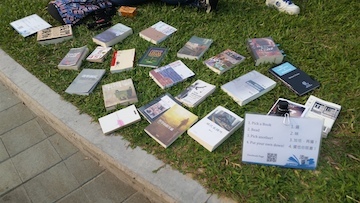 On Friday the students’ application to use Tamar Park was rejected, and instead a pro-Beijing group held a sparsely-attended event there while the students packed another area off to the side of the park. I spent the whole day working on grad school applications (so hard), and only ventured out at night to attend an interfaith discussionon democracy and religion between a Chinese Hong Kong Buddhist practitioner of Tibetan Buddhism, a Muslim Filipina domestic worker, and a white American Protestant reverend at the Kowloon Union Church. The audience was very ethnically diverse, which was exciting to see. It was a fascinating discussion. But perhaps the strongest impression I had was how disturbing it was that many seemed to make a correlation between democracy, Christianity, and human rights, following what I find is an American narrative of political morality. Some people talked about how democracy was the only form of government that protected the rights of all, including the minority, by protecting freedom of speech and freedom of religion. Another person explicitly tied democracy to Franklin Delano Roosevelt’s “Four Freedoms” of freedom of speech, freedom of worship, freedom from want, and freedom from fear, asking that if religion supported these four freedoms, then shouldn’t religion support democracy? Buddhism for the most part was left out of the discussion on human rights, while Islam was strongly criticized as an unfree religion that oppressed women. Audience members made implied connections between the Islamic faith and the Islamic State of Iraq and Syria (ISIS), forcing the Muslim representative to try and defend not just her faith and her family, but all of the Muslim world. The reverend tried to point out the fallacy of the assumption that democracy = good. I added that the world’s commonly-acknowledged most evil government had been created by a democratically elected Adolf Hitler, and tossed in the fact that it was the American democracy that voted to institutionally discriminate against every person of color in the United States – to which the other audience members replied something along the lines of, Yes, well, government and religion should support human rights. I think that yes, they should, but democracy certainly doesn’t guarantee that.